Seriously dude what did you do to your Thomas? Tried to improve him. I was making him a bit more realistic. Unfortunately, he's currently got some busted wiring and will remain inoperable for some time. Why not just get a new one? If I had a Thomas that was inoperable I'd just get a new one. But that's just me. He's the very first of my locos. I'm a sentimental as well as a pack rat. I'm getting the Hornby one for chrismas. And note the operative word "currently" in "Unfortunately, he's currently got some busted wiring and will remain inoperable for some time." I was never quite happy with Thomas' appearance(plus I was attempting to RWS-ify him), so at last I decided to bash him. The major changes I made were: a full set of four lamp-irons(three on the running plate, one on the smokebox in front of the funnel), an open cab, and open cab windows. Unfortunately a wire got pulled off the circuit board, and then more wires got pulled out, one at the motor end. When I do fix him I'm gonna eliminate that circuit board altogether. I'm getting the Hornby one for chrismas. " I was never quite happy with Thomas' appearance." Do you mean the Bachmann Thomas or the Hornby Thomas??? 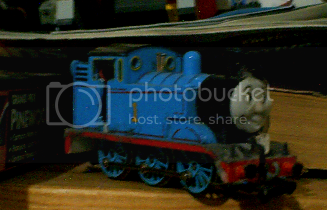 If you meant Bachmann-AAAAAAAAAAAAAAAAAAAAAAAAAAAAAAAAAAAAAAAAAAAAAAAAAAAAAAAAAAAAAAAAAAAAAAAAAAAAH. If you meant Hornby I'm right with ya. Bachmann. The Hornby one will become an RWS model. What annoys me about the Bachmann one is that his cab isn't open. That's nothing a bit of time and effort won't do. Use a mini drill and cut the plastic away, just wire it properly! Well, I accidentally caused practically all of the wires to get pulled off the little circuit board. Then wire them as pick-ups to motor. That's what I did. I'm getting the Hornby one for Xmas. How come on your top-view layout some of the track looks blue? Is it just your camera, lighting, angle, etc. ?